The new John Deere displays are designed to offer tractor operators improved data collection and functionality. John Deere has announced the introduction of a new universal display as a part of its Generation 4 operating system. The John Deere 4640 Universal Display is designed to enhance data collection, increase application functionality, and make it easier for operators to manage their tractors in the field. "The new 4640 Universal Display provides a transportable, easy-to-operate solution for customers with the John Deere Generation 4 operating system," said John Mishler, production and precision ag marketing manager for John Deere. "Some enhancements built into the display include more on-screen help and diagnostic information to keep operators running and informed of their display capabilities; simplified Work Setup app with page-by-page navigation; and greater user customization of run pages." Operators can use the 4640 Universal Display with some of the most common John Deere applications, such as Section Control. It can also import new customer and product information without overwriting existing data. The display improves documentation for high-speed planting, and nutrient applications, in particular, and utilizes the latest data syncing capabilities. 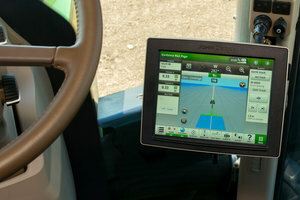 Precision ag software for the display is available in either a one- or five-year subscription plan. Customers can also choose from a plan that only includes AutoTrac, or AutoTrac along with Section Control (Precision Ag Core). "This gives customers a lower cost of entry into these precision ag applications and the ability to try new applications without having to buy permanent software licenses,” Mishler added. More information on the John Deere 4640 Universal Display can be found by speaking to a local John Deere dealer or visiting JohnDeere.com/ag.